To celebrate that Hans Freudenthal (1905–1990) founded Educational Studies in Mathematics (ESM) about 50 years ago (in 1968), and that our journal has reached its 100th volume, we asked former editors (Table 1) to select highly significant articles previously published in ESM and to explain their choices. This, admittedly, was a cruel request, and many former editors were in despair which papers to propose given the many excellent publications in the years of their editorship. Yet, on the basis of their own personal criteria, they all responded. Below you see their choices. Their accompanying texts give a flavor of what they valued as editors and would like to see more of in ESM. Because Freudenthal of course could not make his own choice, we chose for him, namely the very first paper in the journal, his introductory address titled Why to teach mathematics so as to be useful. Taken together, they give a sense of the impressive intellectual achievements of mathematics education researchers over the past 50 years. Freudenthal, H. (1968). Why to teach mathematics so as to be useful. Educational Studies in Mathematics, 1(1–2), 3–8. Clarke, D. (1985). The impact of secondary schooling and secondary mathematics on student mathematical behaviour. Educational Studies in Mathematics, 16(3), 231–257. Clear English which is very important, readable by second language readers also helps. In short, selecting one article from the many which I reviewed was always going to be very difficult, but I hope that my choice of David Clarke’s does justice to the task. Wittmann, E. (1973). The concept of grouping in Jean Piaget’s psychology – Formalization and applications. Educational Studies in Mathematics, 5(2), 125–146. This paper is foremost of historical interest in that it reminds us of the time when Piaget’s theory of cognitive development was of great and even dominant influence in mathematics education, especially later in connection with radical constructivism. Even if various tenets of that theory in the meantime have been criticized and adapted, it might be worthwhile to rethink its relevance for organizing research about learning mathematics. The current focus on empirical research possibly neglects its need for theoretical foundations and the existent ones are very much scattered and compartmentalized. In short, it might pay off to study the classics, to which the Piaget-based research doubtlessly belongs. Otte, M. (2003). Complementarity, sets and numbers. Educational Studies in Mathematics, 53(3), 203–228. In several papers, Michael Otte developed the notion of complementarity, which stems from physics, with regard to mathematical concepts and the learning of mathematics. The basic idea is that many phenomena can and must be studied from diverse points of view which at the first glance appear contradictory. Complementarity refers to the many interrelations between those aspects which only in combination give a satisfactory description. This has been taken up in mathematics education under various seeming dichotomies, such as procedural vs. conceptual, process vs. object, figural vs. conceptual, and empirical vs. theoretical, often interpreted as a kind of hierarchy. Despite or rather because of the intricacies inherent in the notion of complementarity, a deeper study and broader usage of it would have the potential to base research on a sound basis. Fischbein, E. (1999). Intuitions and schemata in mathematical reasoning. Educational Studies in Mathematics, 38(1–3), 11–50. Fischbein doesn’t need an introduction! Noss, R., Pozzi, S., & Hoyles, C. (1999). Touching epistemologies: Meanings of average and variation in nursing practice. Educational Studies in Mathematics, 40(1), 25–51. Tall, D., & Vinner, S. (1981). Concept image and concept definition in mathematics with particular reference to limits and continuity. Educational Studies in Mathematics, 12(2), 151–169. This article, based on earlier work by Shlomo Vinner and Rina Hershkowitz, has provided a poignant framework for thinking about people’s mathematical behavior. It has pointed to a phenomenon that is common in learning all areas of mathematics and has therefore given a tool for many researchers to view their results. At the same time, it has taken as its main example the notion of limit, which has been problematic for probably everybody when they were first faced with it. Maybe the paper has also been an early sign of the advantages of theoretical notions in solving the “major problems in mathematics education,” which Freudenthal had described in an article in the same volume. The first volume ever of ESM (May 1968) was basically a discussion among mathematicians and mathematics education researchers on a single theme (why and how to teach mathematics so as to be useful). The arguments and proposals were specific to mathematical content. 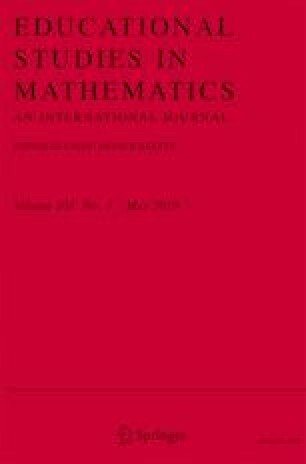 As Editor-in-Chief of ESM, I dreamed of reviving a bit of this spirit of debate on concrete problems of teaching particular mathematical areas among people who taught mathematics reflectively but did not conduct systematic research in mathematics education and professional researchers in mathematics education. So when Frank Uhlig submitted a paper on his experience with teaching linear algebra, I grabbed the opportunity and convinced Jean-Luc Dorier to write a commentary on it from the mathematics education researcher’s point of view: he had just edited a volume on the teaching of linear algebra in Springer and the topic of linear algebra teaching and learning was still quite “hot” at the time. Frank wanted to respond to this commentary, of course. So, in the end, there were three papers debating deeply the subject of linear algebra and its teaching. The fact that it is a debate and that the debate is specific to concrete mathematical content makes these papers represent continuity between the first and the more recent volumes of ESM; the journal is still dedicated to Educational Studies Mathematics (every word counts). Uhlig, F. (2002). The role of proof in comprehending and teaching elementary linear algebra. Educational Studies Mathematics, 50(3), 335–346. Dorier, J.-L., Robert, A., Rogalski, M. (2002). Some comments on `The role of proof in comprehending and teaching elementary linear algebra’ by F. Uhlig. Educational Studies Mathematics, 51(3), 185–192. Uhlig, F. (2003). Author’s Response to the Comments on ‘The Role of Proof in ... Teaching ... Elementary Linear Algebra’, by Frank Uhlig, this Journal, vol. 50.3 (2002), 335–346. Educational Studies Mathematics, 53(3), 271–274. Radford, L. (2006). The anthropology of meaning. Educational Studies Mathematics, 61(1–2), 39–65. This paper deeply addresses questions concerning the relationships among individual, social, and cultural constitutions of the meanings of mathematical objects. In responding to Peirce’s pragmatic rationalism regarding a knowable object at the end of an infinite chain of signification, and Husserl’s intentionalist phenomenology and later attempts to reconcile the role of culture, Radford’s “semiotic-cultural-historic” perspective foreshadowed and influenced trends that developed in the 13 years since the publication of this paper. In perusing the more than 330 papers that were published during my term as editor-in-chief (2009–2013), I found the name of Luis Radford cropping up repeatedly, in several different but related threads, including semiotics, enactivism, embodiment, and the role of gestures in individual constitution of the meanings of mathematical objects, taking into account the cultural-historical role of a teacher in the refinement of these meanings as the “product of a mediated cognitive reflexive praxis” (Radford, 2006, p. 59). These threads are all still in ongoing stages of development. In 2006, Radford wrote that “a contextual objectivity means adopting a critical and reflexive position always open to change and discussion” (p. 61). Lerman, S. (2001). Cultural, discursive psychology: A sociocultural approach to studying the teaching and learning of mathematics. Educational Studies in Mathematics, 46(1–3), 87–113. Darragh, L. (2016). Identity research in mathematics education. Educational Studies in Mathematics, 93(1), 19–33. It was harder to select an article from the last 5 years, because it seems premature to identify something that might only prove to be influential over a longer time frame. So I have chosen Darragh’s article for two reasons. First, although published in 2016, it already has 30 citations, and the citation rate per year is among the highest of all articles published during my editorship. Second, it feels like a “child” or perhaps “grandchild” of Lerman’s article, because Darragh presents a critical review of the burgeoning literature on identity research in mathematics education—the origins of which can be traced back (at least in part) to Lerman’s thinking at the turn of the century. Darragh’s article gives much-needed structure and direction to this emerging field of research.